But who wouldn’t take a shot at this make-in-a-mug and from-scratch and ready-in-five and otherwise-multi-hyphenated winner of a chocolate cake recipe from DizzyDee? You need a 1000 watt microwave or an aptitude for math (to do the conversion) and one microwave-safe (there go those hyphens again and, come to think of it, the parentheses as well) mug for each serving. They want you to dump the finished cake out onto a plate, but they must have servants or dishwashers or something; I’d just eat it out of the mug with an iced tea spoon. Bonus points: pig-shaped stencils on top with a sifting of icing sugar. 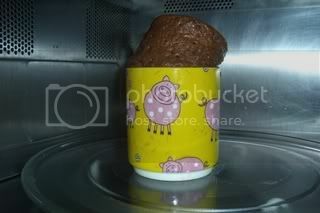 I mean, anybody can make a five minute chocolate mug cake in a pig mug, but a five minute chocolate mug cake in a pig mug with sugar pigs on top? That’s gold star material. Hot Mama Tip Stylin’ Stila Summer Giveaway #3- The Winner! I have a winner for the Stila Lip Glaze Sticks, and of course it is only one person. So that means all the rest of you did not win. More giveaways are in the works, so be sure to check back next week for even more goodies! Just click on my name up there in the orange so that I can get your information. So the rest of you, remember to come back next Saturday for the details on what will hopefully be even more free stuff!